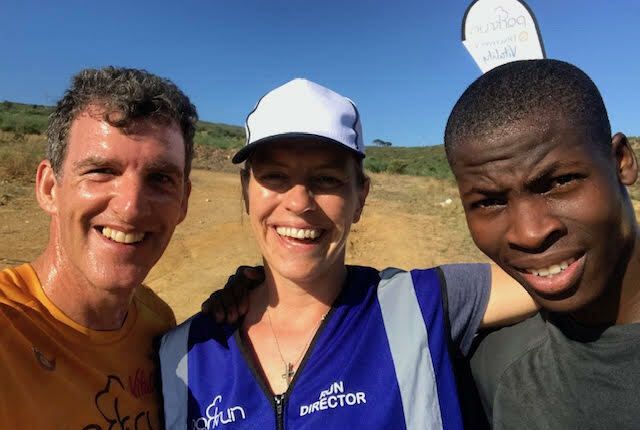 Dr Ollie Hart is a parkrun Ambassador for Health & Wellbeing, and recently he visited South Africa on holiday. 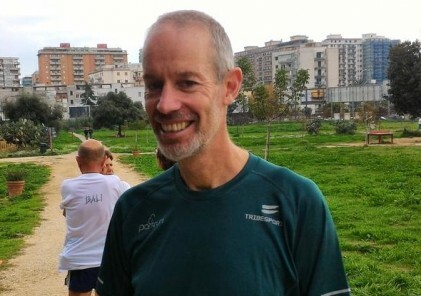 Like many people, he couldn’t resist the opportunity for some international parkrun tourism, and he tells us about his experience. South Africa is a wild and beautiful country with many delights. But I was especially excited at the prospect of becoming a long distance parkrun tourist. I know that under Bruce Fordyce’s energetic leadership parkrun is well established in South Africa. I was visiting the Western Cape and there were plenty of options to choose from near where I was staying. Doing a little research the one that stood out was Kayamandi. On the edge of Stellenbosch, it sounded new, small and with an interesting course. Just as I like it. However, the story that I left with was so much more than I could have imagined. I wasn’t surprised to be greeted by the ubiquitous warm greeting from the Run Director Ros. The enthusiastic welcome of the team setting up the event seems to be a common feature of parkruns the world over. They were optimistically brushing off the discovery that morning of a new building site where their finish line usually is. “No worries we can shift things around a bit, we can make it work”! It felt so familiar, almost the same as turning up at my home event in Graves Park, Sheffield. But as I chatted with fellow runners and walkers, I was to discover Kayamandi is a little different to many other parkruns. I watched Aya set up the finish parkrun flag, overlooked by the Kayamandi township. It was a fairly sobering vista of tightly packed corrugated iron homes, and obvious severe poverty. On the drive in, we almost turned around, slightly intimidated by an environment that seemed very different to the tourist trail we’d experienced so far. Stellenbosch as the centre of Western Cape’s affluent wine industry has a hugely popular parkrun just four miles away. Note surprisingly It gets over 1,000 people each week. But being on the affluent side of town it is out of reach, psychologically and logistically to the residents of Kayamandi. Despite many locals wanting to join in, the physical distance and social perceptions meant very few people attended from this side of town. 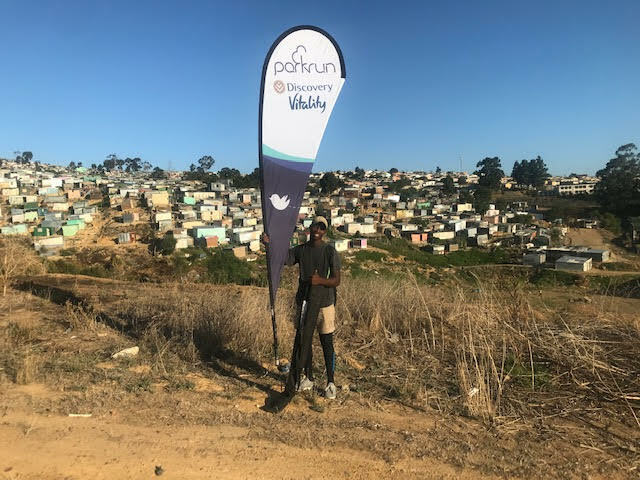 So the Kayamandi locals decided to set up their own parkrun on their doorstep. 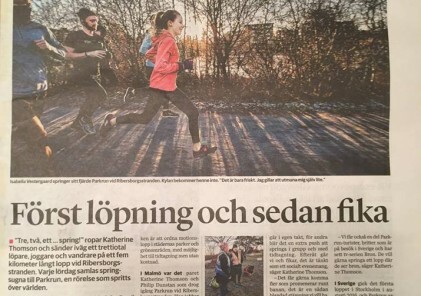 It’s much smaller, but enables people far less privileged to take advantage of all that parkrun has to offer. I was raced by a pack of local children, running with their dad. It was only when I got pipped to the line that I realised some of them were running in flip flops. Many of the children have been gifted running shoes by other parkrunners, but they don’t always manage to hang on to them. As I watched people finish with high-fives, hugs and the familiar runner-rivalries, it was clear to me that this parkrun community is a pioneering group. A great example of how a few brave people can challenge the still prominent ethnic divides, and make headway to repairing historical differences. My mum had come to see what the event was all about. At 73 and wearing a dress and sandals she had no intention of taking part. But the Tail Walker Nicola talked her into walking around with her. 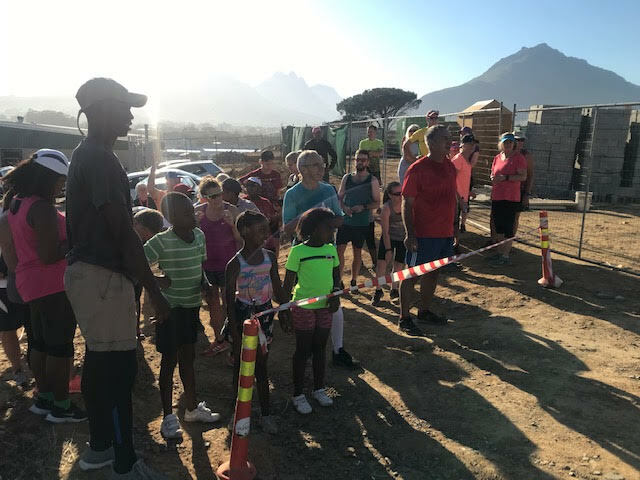 So she did her first ever parkrun at Kayamandi! Between us both we heard the story from all angles. This event is a true mix of ethnicity, cultures and wealth, but united by a love for parkrun, and the community it has generated. For me, it reinforced all that I love about parkrun-palpable enthusiasm and camaraderie, a strong sense of people wanting to support their fellow humankind, and a beautiful location to run and feel free in the open air. It was a real privilege to feel welcomed and included by this community. It’s a 5k event every Saturday morning just like everywhere else in the world, but with a location and story that’s a little different.